For a few years I’ve been separated from my family. Much of is my fault, although sometimes I guess it looks rather two sided. My dear friends were very comforting this weekend. They helped me understand my own failures and to strive for forgiveness and humility. Forgiveness is a hard thing in this world. With my father’s passing I realize more than ever the need to live a good life. I spent much of the weekend staying busy. Taking in a few hands of poker with buddies, celebrating a good friends birthday on the beach with new friends and new faces. The first real memories of my father and I came on a camping trip with my sister Kelli and my Dad out in Golden Gate Canyon outside Golden,Colorado. I was throwing rocks in the air and my sister Kelli proclaimed Look at the Moon David! and after tossing a rock straight up in the air I looked at the moon. That rock nearly struck me in the head. My Dad had such a sense of humor. Something I never gained much of. Ok I guess I did. Just a far different kind. My Dad and I for nearly a year spent time going to a Photography Club together. At first I hated it. But later I realized it was some of the most valuable time I ever spent with him. It was during these trips that we often took side trips and headed to the Army/Navy Store, headed off for secret Spaghetti Nights at Dino’s, and often would watch the trains come in at Union Station in Downtown Denver. As a young boy my father, and me, and our neighbor George would get up way to early and head out to take a walk around Crown Hill Park in Lakewood. After our walk usually I walked alone, ahead of the my dad and his neighbor friend and sometimes I jogged. I loved the alone time and the freedom he gave me. After a long walk we would often head out to eat breakfast together. And it was almost always at The Diner. 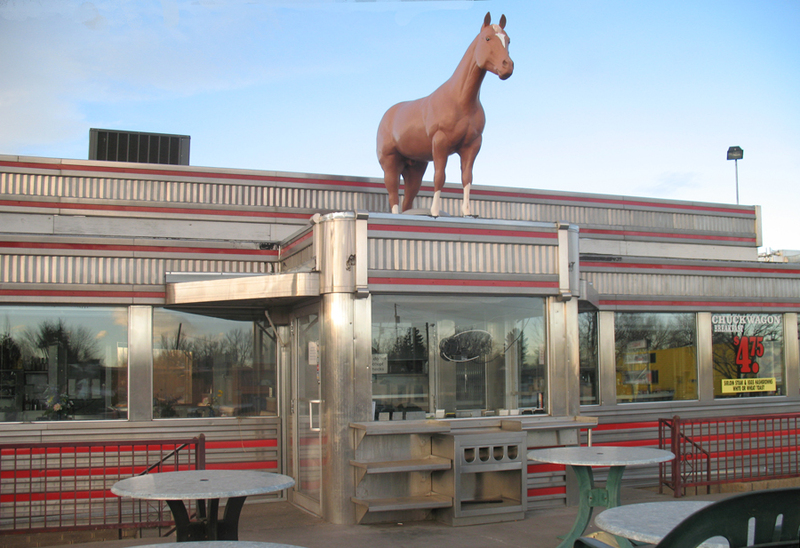 Davies Chuck Wagon Diner is a nostalgic little place that has its own atmosphere. It is highlighted by Blue Collar workers, and older waitresses who are overworked and obviously undertipped. The atmosphere was always busy busy busy. My Dad and I always waited for a booth and would usually play a song or two from the juke box. He often took moments like this to talk to me about the important things in life like career path, women, and reminiscing on his childhood and music. I would always finish my whole meal as he would guilt me to no end if I didn’t. And we would head home. Me to my world of sports and isolationism and he to his world of photography,jazz, airbrush cartoons, and writing. Those mornings at Davies are sweet spots for me. Moments I will always cherish and long one day to take my children there and share with them the very same things he shared with me. Often on Saturday Afternoon, or Sunday we would head out to the Jazz Record Revival. The store was located on East Broadway in Denver and the floor was wooden, and dusty. The shelves were filled with LP’s thousands of them. The store was always playing some early Jazz Musician and I could always sense my father was entering a world where time no longer existed. I cherish every minute I spent in this rickety old store with my father. It was like a time machine for him. And he was always peaceful and a man of compassion after spending an hour or more listening to Jazz and pondering out which LP’s to buy and sneak back into the house before Mom would notice. My father and I would often talk about food of his childhood. From Maid-Rites to Moon Pies, to his mother’s cooking. Sometimes on the weekends when we had alone time. He and I would sneak off in his old 1979 Chevy Pickup and head to the drug store. We would buy 2 RC Cola’s and 2 Moonpies. Often times he would buy me a magazine or a pack of football cards. We would either sit in the truck or drive around the corner to the park by Dino’s and talk. Often times he would just listen while I talked my head off about my dreams, or what football players I liked. Or what stats I had memorized. There’s something about these moments that I still reflect on. I always remember him when I buy a moon pie, and it always comes with an RC Cola. I’ve never been a big fan of chew. But the first time I tried it was with my father. I nearly puked. The feeling of nausea overwhelmed me. Likewise however the first time I smoke a cigar was with him. To this day I think of him when I fire up a Cuban at La Casa Del Habano. There are a hundred and one other places I could talk about these are just a few on my mind this morning. My father was a gentle man, a kind man, with a roaring sense of humor, an abundant sense of compassion, and a smidgen of rebel in him. In my world he was and is a legend. A man who I will never live up to in status. He left behind many people who loved him,cared about him, and will miss him. In me he left behind a sense of compassion, a sense of determination to cherish the moments we have, to explore whole-heartedly our passions, and to seek fully our aspirations. Although we were not close over the last few years it was him who got me motivated to work on the web. It was him who got me interested in travel and expanding my horizons. It was him who taught me how to turn the lights off. It was him who taught me how to love strangers. It was him who taught me to cry. To share my heart. In the beginning years of my life it was my father who saved me from a world of disaster. Thanks Pops! I love you and I miss you. Great Post! I was just thinking today about the moments that others have that remind them of loved ones. As I was watering flowers in my new flower Garden remembering my friend Gladys how she loved to water her flower Garden as she hummed. Funny the things that a person remembers. I also was a big fan of moon pies. By the way the green back ground is great.